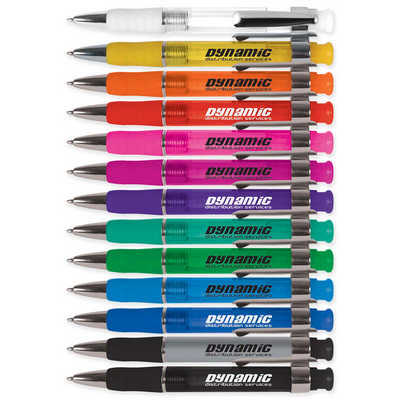 Push button ballpoint pen with solid colour rubber grip. Optional black suede velvet pouch. Writing distance: 2.1 kilometres. TC roller ball. Nero pigment ink. Colours - Clear/White/Silver, Silver/Black, Transparent Black/Silver, Transparent Dark Blue/Silver, Transparent Dark Green/Silver, Transparent Green/Silver, Transparent Hot Pink/Silver, Transparent Light Blue/Silver, Transparent Orange/Silver, Transparent Pink/Silver, Transparent Purple/Silver, Transparent Red/Silver, Transparent Yellow/Silver Size - Barrel: 134mmL x 13mm Diameter, Grip: 12mm Diameter Decoration Area(s) - Pad Print : Barrel - 45 x 9mm (LxH); Pad Print with Pouch : Barrel - 45 x 9mm (LxH); 4CP Digital Direct Print : Barrel - 45 x 8mm (LxH); 4CP Digital Direct Print with Pouch : Barrel - 45 x 8mm (LxH). Price includes : 1 Col 1 Pos Print. Setup is included.